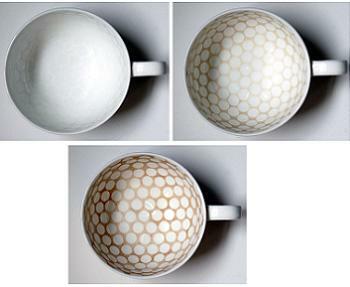 The problem with white coffee mugs and tea cups is that they can stain and yellow with use over time . It’s usually not much of a problem (since it happens to the whole set), but one designer decided to take advantage of this by creating the Stain Tea Cup. The tea cups are etched with a design that is stained by tea with repeated use, so the more you use the cup, the more dramatic and distinctive the cup becomes. They are being sold by the designer for £35 each, and seem to be available with different patterns.